A great month for striped marlin here in Cabo. These beauties are here year round, and January is one of their peak months. The weather is also perfect, as you can see in the temps below. You can also hope to be hitting yellowfin, mackerel, wahoo and dorado. Interested in a good fight? Inshore fishing for rooster is decent in January too. In February we welcome Grouper and Snapper to the party! Most people think of deep sea fishing for marlin when they think of Cabo — but inshore are some of the best fish for cooking: Snapper and Grouper. Striped Marlin are in top form during February, putting up the fight you travelled here for! Swordfish start to come around in February too. Interested in something good to cook up during your trip here to Cabo? March is a B-I-N-G-O for some of the tastiest fish around. Snapper and Grouper arrive in February, but March is when the real season for these guys heats up. More interested in the big boys? Striped Marlin and Swordfish are on-point in March! Start limbering up — you’re going the full 12 rounds with these guys. April is similar to March here in Cabo with consistent hits from Striped Marlin offshore. Yellofin tuna can also be found on deep sea charters when we head out 20-30 miles offshore. Also a solid month for inshore fish like mackerel, grouper and rooster fish. Stick around on the boat after your charter, we’ll break out the grill and cook up some fresh fish and hang out for some beers. The water is warming up and do you know what that means? The Blue Marlin and Black Marlin are knocking at the door. The Blues and Blacks are the main reason everyone flocks to Cabo to get out on the water and test their grit. I hope you’re ready to get to work. You might be in for the catch of a lifetime. It’s your choice, but we do recommend catch and release of these top-shelf fighters. Let’s keep ‘em coming back for more. June is a favorite month for a couple particularly tasty reasons: Dorado and Wahoo. 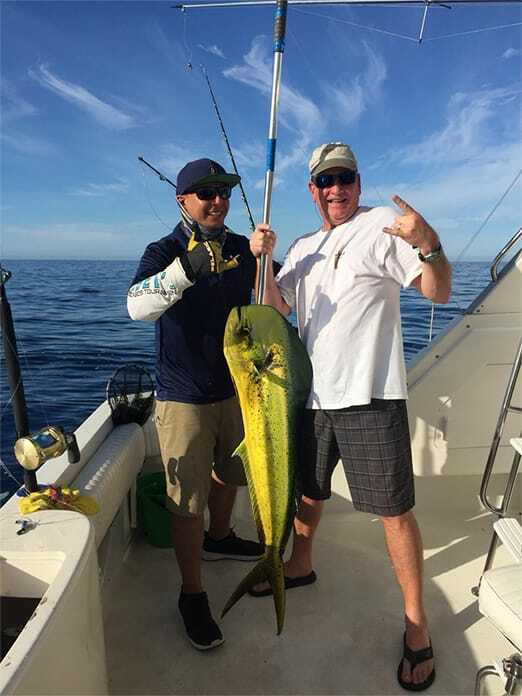 If you’re looking for a mix of a solid fight and enjoying the results cooked up on a patio later it doesn’t get better than Dorado and Wahoo season. Wahoo are some of the fastest fish on the planet, Dorado are aggressive, and they both work like magic on the grill. Swordfish are still around in June for some action before they leave for the season. July boasts an all-star lineup. The 2018 Red Sox of fishing. On land: Town isn’t nearly as busy as the holiday season and spring break, making it easy to relax and enjoy a slightly slower-paced Cabo than high-season. At Sea: All of the fan-favorites are here. We’re talking the biggest game, Black Marlin and Blue Marlin. We’re talking mid-game fighters with Wahoo and Dorado. You could even be hitting some Yellowfin which dive deep and put your strength to the test. Another star-studded month for fishing here in Cabo San Lucas. Blues, Blacks, Striped, Dorado, Wahoo. Pack your bags and move down for as long as you can in August. Maybe you won’t leave. If we’re doing sports analogies here, October is the Super Bowl of fishing and September is the playoffs. A big month for all the marlins: Black Marlin, Blue Marlin, Striped Marlin. Great action from Dorado, Wahoo and Yellowfin. Sailfish start poking their nose around in August and by September they’re peaking in activity. This is the big one. Tournament season. The highest paying fishing tournament in the world with a cash purse that ranges from $3,000,000 to over $4,000,000 USD each year. This is the Super Bowl. The World Series. All of the best fishermen from all over the world come here to test their mettle. Seasoned vets to rookies are all trying to make the big show here. Everything you’ve dreamt of catching is here and putting up a fight in October. Book early, October sells out for sure. Still very similar to October with a gradual departure of the Blue Marlin and Black Marlin. The waters are cooling down and they’re packing their bags. Absolutely a premium month for Dorado, Yellowfin and Mackerel. December is holiday season and there’s lots of fun to be had fishing in Cabo. Get some yellowfin for fresh sashimi, Mackerel, Dorado and Wahoo for the grill or some fresh ceviche. We see a lot of families down here for the holidays — what better time to enjoy family life than December reeling in some fish in the warm sun and clear skies? As consistent as they get in these parts. The Striped Marlin are full-time residents and can be found here pretty much any month of the year. See the calendar here for their best months. These are the big draw. Every angler’s dream catch. They put up huge fights that can last for hours and hours. We love to release these so they can continue to produce and thrive here in Cabo San Lucas. Dorado are always a great time when they’re biting. They’re feisty, fast and get aggressive on the lures. A plentiful catch, they are a premium fish for hitting the grill for a tasty, well earned lunch. These striped speeders tend to cruise the blue alone, sometimes in small groups, but they don’t typically school together. Wahoo are related to Mackerel and are some of the fastest fish in the sea and put up a great fight. So let’s go get something good to eat! Technically Mackerel is the family name for a wide variety of sub-species (including Wahoo). Around Cabo we see some good fights from the speedy Sierra and Spanish Mackerel.